'Once Oneida healer Russell FourEagles (Atuneyute Keya) went to see his friend Bob, whom doctors had declared incurably paralyzed following a stroke. Within minutes of FourEagles� attention, Bob was kicking the covers off the bed. �You should write a book!� Bob later encouraged. And here it is. FourEagles� grandparents escaped the reservation-school education that obliterated Native American culture, preserving the healing abilities that can be traced in an unbroken lineage back two hundred grandmothers. In The Making of a Healer, he openly shares his knowledge in an effort to keep the old wisdom and practices from being forgotten. 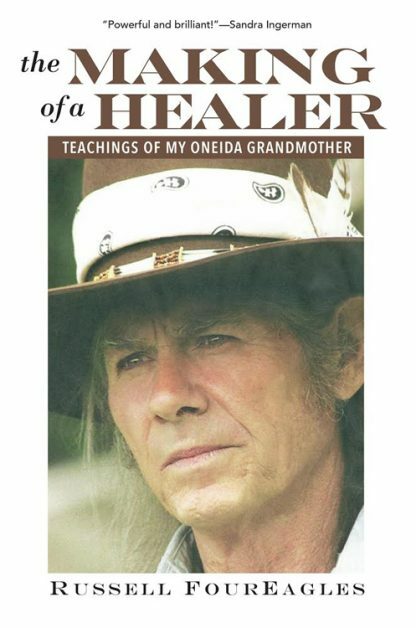 Recounting sacred Oneida myths and cosmology, he describes the healing powers of the Fire Ceremony, energy exchange, and humor; discusses natural remedies; and explains how he healed himself from post-traumatic stress disorder after serving in the Vietnam War. Russell FourEagles is a spiritual/energy healer with over 40 years of experience. He has performed over 45,000 healings in Canada, Central and South America, Europe, Indonesia, Thailand and across the United States, and visitors come to his healing center from all over the world. Russell has lived in Wisconsin most of his life, except for a stint in the U.S. Army in Vietnam. He finished his Medicine work apprenticeship under the tutelage of his Oneida Grandmother when he was 25 years old, but studied off and on until age 31. He began practicing the traditional medicine work in 1973 and due to demand, he opened Soaring Eagles Wellness Center in 1998. Russell has regularly sponsored seasonal healing conferences at the Soaring Eagles grounds, and has offered workshops on a number of Native American practices. He has also taught workshops at the University of Wisconsin-Menomonie on the traditional Oneida Healing and regularly speaks as a Native American Medicine Man and Holy Man at Native American gatherings and festivals across the country. Russell FourEagles is an oft sought-after source of wisdom on the authentic ways of the Original people locally, nationally, and worldwide. He openly shares this knowledge so that the old ways are not forgotten. Russell's Grandfather was captured living in the wilds of Canada and taken to the Couchiching Reserve in 1870, where he escaped and immigrated to the U.S. and settled near the Oneida Reservation, but not onto it. The medicine that Russell FourEagles's Grandmother taught him was therefore never broken and came directly down the lineage, since living off the reservation meant that none of his ancestors ever went to boarding school. His Grandmother learned from her grandmother and she learned from her grandmother back two hundred grandmothers.